Gold coins can be a great way to invest in gold and when the need arises, you can make yourself a nice earning from them. If you decide the time is now and would like to take advantage of the current high price of gold, we at Brisbane Gold Buyers can help you. 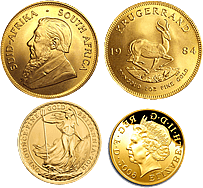 Just describe the type of gold coin you own and our experienced team we'll provide you with an accurate quote over the phone. If the quote matches your expectations and you're happy to proceed, we'll then come to you, to purchase your gold coins on the spot.